The CFSI Board of Directors and staff extend their sympathies to the family of Senator John McCain on the loss of a true American hero, distinguished Senator of Arizona and an original co-chairman of the Congressional Fire Services Caucus. The Congressional Fire Services Institute (CFSI) presented Senator Jon Tester (MT) the 2018 CFSI Legislator of the Year. A co-chair of the Congressional Fire Services Caucus since 2013, Senator Tester has been a tireless champion on Capitol Hill for the nation’s fire and emergency services. 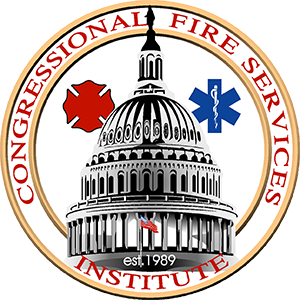 The Congressional Fire Services Institute (CFSI) is announcing an official Call for Proposals for the 2019 National Fire and Emergency Services Symposium. The Symposium will be held in Washington, DC on Wednesday, April 24-25, 2019, in conjunction with the 31st Annual National Fire and Emergency Services Dinner. It’s never too early to think about the ideal Holiday gift for your family, friends and fellow firefighters, and we have the perfect gift in mind: the 2018 National Fire Service Christmas ornament. Capturing the Holiday Spirit and the proud heritage of our nation’s fire service, this beautiful keepsake is the ideal gift for any member or supporter of our nation’s fire and emergency services. Handcrafted using the highest quality materials, these ornaments are made right here in the USA! (May 17, 2018) – Sunday May 20, 2018 marks the beginning of National EMS Week and presents an opportunity to honor the men and women who deliver pre-hospital 9-1-1 emergency medical care throughout the United States. This vital public safety service is provided primarily by cross-trained, multi-role emergency responders who are based in our nation’s fire departments. Approximately 1,500 fire service officials from across the nation gathered together to engage their peers and federal leaders in discussions on a broad range of issues being addressed on Capitol Hill and by the Trump Administration. At the end of the two-day program, they assembled in the Washington Hilton ballroom to pay tribute to fire service leaders and organizations for their outstanding leadership in addressing the health and safety of our nation’s firefighters and emergency services personnel. The Congressional Fire Services Institute is pleased to announce that the Honorable Kirstjen Nielsen, Secretary of the Department of Homeland Security, will address the 30th Annual National Fire and Emergency Services Dinner on April 19, 2018 at the Washington Hilton, in Washington, DC. This past year, Congress approved legislation to reauthorize the Assistance to Firefighters and Staffing for Adequate Fire and Emergency Response grant programs, and the United States Fire Administration. In addition, Congress approved the tax bill that included major provisions of the Fire Sprinkler Incentive Act. It took us 15 years but we were finally able to convince Congress to take action on this measure. In 2010, the Congressional Fire Services Institute (CFSI) established the Excellence in Fire Service-Based EMS Awards. The awards recognize career, volunteer and combination fire departments that have implemented innovative programs to enhance the delivery of emergency medical services in their communities.